Due to the migratory nature of sea turtles- implementation of conservation efforts need to be orchestrated and undertaken at National level with international collaboration for regional management. It is no use protecting sea turtles in one area of the Mediterranean Sea while they are still killed elsewhere in the region. Since the 1970’s there have been considerable efforts to protect sea turtles and critical nesting habitat in the Mediterranean. Local and National conservation activities were enhanced in the 1980s and 1990s through the support of international organizations and initiatives including: the United Nations Environment Programme (UNEP) Mediterranean Action Plan (MAP), Convention for Migratory Species (CMS), World Conservation Union (IUCN), the Council of Europe and the European Union. However, regionally inclusive cooperation between countries for sea turtle conservation is still lacking. Agenda 21, the Rio Declaration on Environment and Development, and the Statement of principles for the Sustainable Management of Forests were adopted by more than 178 Governments at the United Nations Conference on Environment and Development (UNCED) held in Rio de Janerio, Brazil, 3 to 14 June 1992. Unregulated trade in wildlife has become a major factor in the decline of many species of animals and plants. In 1975 an international convention was established to prevent international trade from threatening species with extinction. This treaty is known as the Convention on International Trade in Endangered Species of Wild Fauna and Flora (CITES). The Convention on the Conservation of European Wildlife and Natural Habitats (the Bern Convention) was adopted in Bern, Switzerland in 1979, and came into force in 1982. The principal aims of the Convention are to ensure conservation and protection of wild plant and animal species and their natural habitats (listed in Appendices I and II of the Convention), to increase cooperation between contracting parties, and to regulate the exploitation of those species (including migratory species) listed in Appendix 3. To this end the Convention imposes legal obligations on contracting parties, protecting over 500 wild plant species and more than 1000 wild animal species. To implement the Bern Convention in Europe, the European Community adopted Council Directive 79/409/EEC on the Conservation of Wild Birds (the EC Birds Directive) in 1979, and Council Directive 92/43/EEC on the Conservation of Natural Habitats and of Wild Fauna and Flora (the EC Habitats Directive) in 1992. Among other things the Directives provide for the establishment of a European network of protected areas (Natura 2000), to tackle the continuing losses of European biodiversity on land, at the coast and in the sea to human activities. The Convention on the Conservation of Migratory Species of Wild Animals (also known as CMS or Bonn Convention) aims to conserve terrestrial, marine and avian migratory species throughout their range. It is an intergovernmental treaty, concluded under the aegis of the United Nations Environment Programme, concerned with the conservation of wildlife and habitats on a global scale. Since the Convention's entry into force, its membership has grown steadily to include 104 (as of 1January 2008) Parties from Africa, Central and South America, Asia, Europe and Oceania. The objective of the Bonn Convention is the conservation of migratory species worldwide. Wild animals require special attention because of their importance from the environmental, ecological, genetic, scientific, recreational, cultural, educational, social and economic points of view. CMS acts as a framework Convention. The Agreements may range from legally binding treaties (called Agreements) to less formal instruments, such as Memoranda of Understanding, and can be adapted to the requirements of particular regions. The development of models tailored according to the conservation needs throughout the migratory range is a unique capacity to CMS. The objectives are to encourage individual and joint action for the conservation, utilization and development of soil, water, flora and fauna for the present and future welfare of mankind, from an economic, nutritional, scientific, educational, cultural and aesthetic point of view. Populations of marine turtles in the Mediterranean have been decreasing steadily through the last decades. Incidental catches by fishing gears, Sea pollution and the use of the nesting beaches are the main causes of marine turtles decline. The Mediterranean countries within the framework of the Mediterranean Action Plan, adopted in 1989 the Action Plan for the Conservation of Mediterranean Marine Turtle. 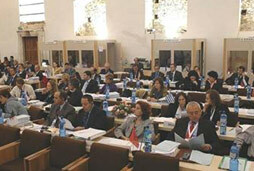 The Parties to the Barcelona Convention included among their priority targets for the period 1985-1995 the protection of Mediterranean marine turtles (Genoa Declaration, September 1985). To this purpose and as a response to growing international concern about the status of marine turtles in the Mediterranean, which encounter various threats, including mortality in fishing gear and loss of vital habitats on land (nesting beaches), they adopted in 1989 the Action Plan for the Conservation of Mediterranean Marine Turtles. In 1996, the Parties confirmed their commitment to the conservation of marine turtles by including the 5 species of marine turtle recorded for the Mediterranean in the List of Endangered and Threatened Species annexed to the Protocol concerning Specially Protected Areas and Biological Diversity in the Mediterranean (Barcelona, 1995). The Protocol calls on the Parties to continue to cooperate in implementing those action plans already adopted. The Action Plan for the Conservation of Marine Turtles was revised in 1998-1999 and therevised Action Plan was adopted at the 11th Meeting of the Contracting Parties to the Barcelona Convention in Malta in October 1999. Following the request of the Contracting Parties to the Barcelona Convention (Portoroz, 2005), RAC/SPA is preparing an update of the Action Plan for the Conservation of Marine Turtles in the Mediterranean to be submitted to the 8th Meeting of RAC/SPA National Focal Points. With the aim of updating the Action Plan the Regional Activity Centre for Specially Protected Areas RAC/SPA (UNEP/MAP) in collaboration and with the support of the Libyan Environmental General Authority (EGA), convened an ad hoc meeting of independent experts at Misuratah, Libya, 15-16 November 2006. The experts reviewed the old Action Plan in view of the experience and information gained since it was first implemented in 1999. The Habitats Directive (together with the Birds Directive) forms the cornerstone of Europe's nature conservation policy. It is built around two pillars: the Natura 2000 network of protected sites and the strict system of species protection. All in all the directive protects over 1.000 animals and plant species and over 200 so called "habitat types" (e.g. special types of forests, meadows, wetlands, etc. ), which are of European importance. Natura 2000 is the centrepiece of EU nature & biodiversity policy. It is an EU-wide network of nature protection areas established under the 1992 Habitats Directive. The aim of the network is to assure the long-term survival of Europe's most valuable and threatened species and habitats. It is comprised of Special Areas of Conservation (SAC) designated by Member States under the Habitats Directive, and also incorporates Special Protection Areas (SPAs) which they designate under the 1979 Birds Directive. Natura 2000 is not a system of strict nature reserves where all human activities are excluded. Whereas the network will certainly include nature reserves most of the land is likely to continue to be privately owned and the emphasis will be on ensuring that future management is sustainable, both ecologically and economically. The establishment of this network of protected areas also fulfils a Community obligation under the UN Convention on Biological Diversity. Natura 2000 applies to Birds Sites and to Habitats Sites, which are divided into biogeographical regions. It also applies to the marine environment. The Convention for the Protection of the Marine Environment of the North-East Atlantic was opened for signature at the Ministerial Meeting of the Oslo and Paris Commissions, Paris, 21-22 September 1992. The Convention has been signed by all Contracting Parties to the Oslo Convention and to the Paris Convention (Belgium, Denmark, Finland, France, Germany, Iceland, Ireland, Netherlands, Norway, Portugal, Spain, Sweden, and the United Kingdom of Great Britain and Northern Ireland), Luxembourg, Switzerland and the Commission of the European Communities. The Helsinki Commission, or HELCOM, works to protect the marine environment of the Baltic Sea from all sources of pollution through intergovernmental co-operation between Denmark, Estonia, the European Community, Finland, Germany, Latvia, Lithuania, Poland, Russia and Sweden. HELCOM is the governing body of the "Convention on the Protection of the Marine Environment of the Baltic Sea Area" - more usually known as the Helsinki Convention. HELCOM’s vision for the future is a healthy Baltic Sea environment with diverse biological components functioning in balance, resulting in a good ecological status and supporting a wide range of sustainable economic and social activities. • a co-coordinating body, ascertaining multilateral response in case of major maritime incidents. For three decades HELCOM has been working to protect the marine environment of the Baltic Sea. This work has been driven by the specific environmental, economic and social situation in the Baltic region and the specific sensitivity of the Baltic Sea. The work of HELCOM has led to improvements in various fields, but further work is still needed.